Few archosaurs invoke the title "ruling reptiles" more so than crocodiles. Popular and iconic crocodiles never seem completely satisfied as mere aquatic predators. Never content playing second fiddle to anything in their respective environment- these macropredators challenge, and often win, the dominant mammals around them. And the extent to which crocodiles venture onto land in order to hunt or procure carrion is little appreciated. This reptilian insubordinance hints at a rich and varied ecological history for the group. Crocodylian skulls have been phylogenetically plastic. But the morphospatial region within which they have varied is rather narrow; a limited number of anatomical solutions may exist for a given ecological problem, and because crocodylians tend to interact with their surroundings with their snouts, similar snout morphologies seem to have arisen multiple times in disparate lineages. This may be partially responsible for the widespread view that crocodylians (and crocodyliforms generally) are “living fossils” that have changed little since the Mesozoic. When the group as a whole (living and extinct) is viewed in a phylogenetic context, they no longer look so static. So the crux of the matter is that differing crocodile lineages, constrained by ecological design, come up with remarkably consistent solutions to fit their given morpho-eco space. In this manner crocodiles appear relatively little unchanged since the Mesozoic but in truth we have multiple lineages adapting to the unchanging constraints of living as an amphibious predator repeatedly throughout their geological history. One of the revelations in recent years has been the unexpected diversity of crocs in the Mesozoic. Indeed the variety of crocodiles in this time period borders on the comical- and ultimately suggests that they were aggressive competitors with dinosaurs, marine reptiles, and mammals for an astonishing variety of niches. 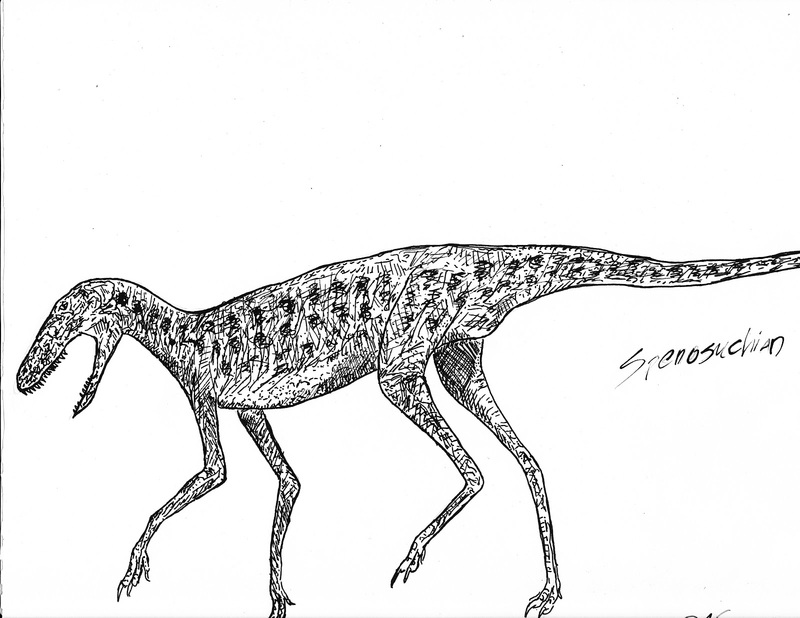 Giving theropods a run for their money and perhaps grabbing the top terrestrial predator throne in parts of Cretaceous Gondwanaland were the Sebecosuchids. Growing up to 4 meters long, these were not insignificant predators and if alive today would no doubt be considered large predators. How and to what extent they interacted with theropods has been of great interest and conjecture. They were most likely ambush rather than pursuit predators and possibly tried to give a devastating first blow to the prey to mortally wound it. 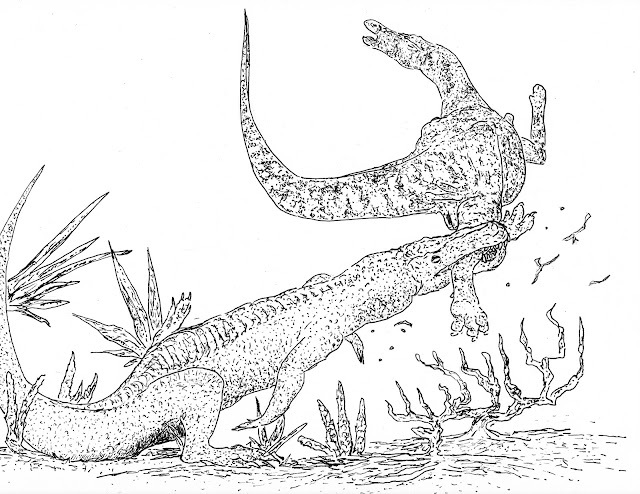 Sebecosuchian attacking an indeterminate ornithopod. Illustration by Author. But there were also smaller more gracile guys like the Spenosuchians. Indeed this veritable racehorse of a croc so characterized early crocodilians as terrestrial runners that the four chambered heart of modern crocodiles is most parsimoniously explained as an anatomical anachronism leftover from when crocodiles were actually endothermic (warm blooded). As crocodiles expanded into freshwater niches as ambush predators a slower metabolism was evolved that more suited that lifestyle. Well, this post is not meant to be exhaustive- I just wanted to dispel the myth of modern crocs as "evolutionary holdovers from the distant past". This topic has been blogged about extensively by Darren Naish, check out the links below.